I'm excited to be back as your hostess for Day 6 of 12 Days of 3D Christmas with creations created by the Creations by AR Design Team. Each day, one of the Designers will be sharing a 3D Christmas project on the Creations by AR Paper Craft Planet Group created with one or more of Adela's wonderful templates (templates are available as PDF's and also for cutting machines). I love the adding Rosettes to my cards and projects, with Adela's new Accordion Rosette Set, creating these lovely blossoms is a breeze! This template is created to be scored at either 1/4" or 1/2" intervals, and works perfectly with the Scor-Pal, you've gotta love that! This template also includes a variety of flower centers. I used the Accordion Rosette Set to create this beautiful wreath, cutting the images from Prima's Printery Paper Stack using the eCraft. I created a circle using SCAL for my wreath form, cutting from thin cardboard. Once my Rosette's were created, I hot glued the centers, then hot glued them to my wreath form. I swiped the Rosette's with Versamark then embossed with Tinsel Embossing Powder to add a bit of shimmer. WANT TO WIN THE ACCORDION ROSETTE SET AND THE TAKE OUT PIZZA GIFT CARD TEMPLATES ? It's easy! Commenting on this post is welcome but does not enter you into the contest. To enter the contest, you'll need to leave a comment on the Creations by AR Paper Craft Planet Group before the next day's post is up to be eligible to win! TWO random visitors will win the Accordion Rosette Set Template and Take out Pizza Gift Card Templates! 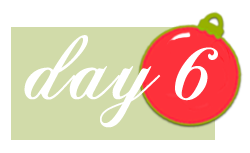 Be sure to check back on the PCP Group for Day 6 on December 14th, to see if you are one of the lucky winners! LOVE your beautiful and unique wreath! First time visiting your blog and I just had to comment.....W-O-W !!! All your work is amazing! The wreath is stunning and the hours you must have spent making it were definitely well worth it! I will definitely be back! This is wonderful!!! I want it!!! What a great project...fantastic work! Such a gorgeous project! I love your flowers! Such a fantastic creation! Love the floral wreath, so very festive! Have a great one! Wow, that wreath is amazing!! Love how that rozette looks great. now THAT'S my kinda wreath! it's stunning! Just luvin' this Lisa, beautiful!